AMSOIL SEVERE GEAR Synthetic Extreme Pressure (EP) Lubricant 75W-90 Formulated for the severe operating conditions of today's pick-up trucks, SUVs, heavy equipment and other hard working vehicles. SEVERE GEAR� Synthetic Extreme Pressure (EP) Lubricant 75W-140 (SVO) Formulated for the severe operating conditions of today�s pick-up trucks, SUVs, heavy equipment and other hard working vehicles. 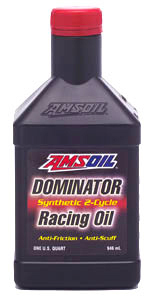 DOMINATOR, an AMSOIL exclusive formulation, lubricates and protects high performance two-cycle motors, both on and off the track. 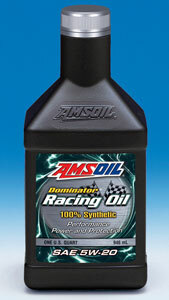 DOMINATOR reduces friction and protects pistons and bearings subjected to the rigors of racing. High performance motors, particularly those that are modified, operate hotter and at higher RPMs than recreational motors, and they need good oil for peak performance. DOMINATOR is engineered for racing. 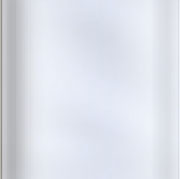 It has the right film strength and clean burning properties for "on the edge" operation. 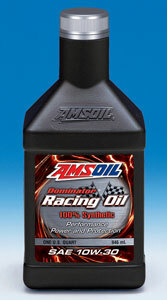 AMSOIL SuperShift� contains top quality additives selected specifically for racing applications. Its unmatched transmission friction performance provides high holding capacity for maximum torque transfer and brake power, reduced wear and longer clutch plate life. Super Shift� virtually eliminates slippage, promotes positive clutch engagement and improves overall shift performance, helping racers improve on elapsed times. 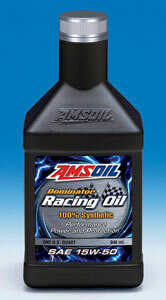 AMSOIL DOMINATOR Synthetic Racing Grease is engineered to protect high-performance bearings and chassis components in racing applications operated on snow, dirt, water or track. 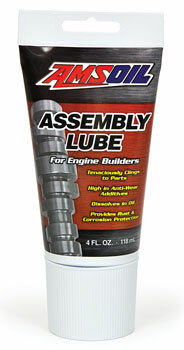 It provides superior protection for bearings operating under high-speed, high-heat and heavy-load conditions.